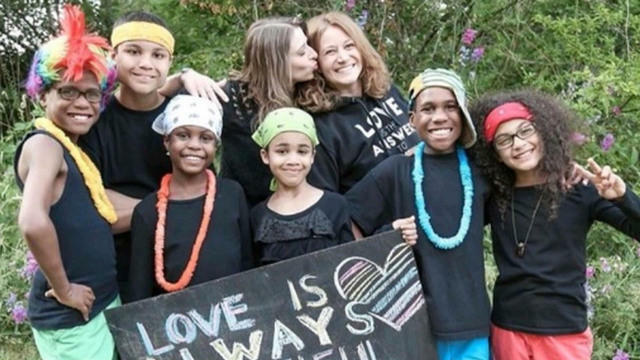 PORTLAND, Ore. -- The attorney for the biological aunt of three of the six children who are presumed to have died when the car their adoptive mother was driving plunged off a cliff says the children never should have been taken from their family in Texas, reports CBS affiliate KOIN. Devonte, Jeremiah, and Sierra were adopted by Jennifer and Sarah Hart in 2009. Jeremiah's body was found the day the Harts' car was discovered crashed off a northern California cliff on March 26. Devonte and Sierra have not been found, but investigators presume both to be dead. The crash is believed to be intentional. According to the station, a Texas appeals court opinion from 2010 reveals details about aunt Priscilla Celestine's fight to keep custody of the three children. The children's biological mother is reportedly said to have been a long-time cocaine abuser who had a history with the Department of Family and Protective Services dating back to 1985. Devonte, Jeremiah, Sierra and a fourth child were removed from her care after she tested positive for cocaine following the birth of her seventh child in 2006. The mother, who the station is choosing not identify by name at this point, reportedly just learned of her children's death. Her husband told the station that she is "taking it hard." "The way they went about moving the kids from here was wrong - they never should have been moved away from Texas," the husband said. According to KOIN, Celestine was originally given custody of the three children but they were reportedly removed after less than six months when it was discovered that the children's biological mother had visited them – a visit the children's caseworker did not approve. Celestine's attorney, Shonda Jones, told KOIN that she thought the fact that the children were removed from her client's care after a single mistake was an "injustice." She described the children's aunt as a hard-working woman who would have been a good influence on the children. "I don't think this woman would have even had a traffic ticket," Jones said. "All she did was work and go home." Jones remembered that Celestine had moved out of her three-bedroom apartment to a five-bedroom townhome to ensure the children were comfortable. "They're so young and they've already had trauma in their lives. The only relative that they knew - I felt she was such a good candidate," Jones said. "[Child Protective Services] had vetted her; if she wasn't such a good candidate, they wouldn't have placed them with her." An uneven portrait of the Hart family has emerged from the accounts of friends and neighbors, some of whom said the two women were devoted mothers who were often seen attending local rallies and marches with their children. But a former friend told The Associated Press last week that she told Oregon child welfare officials in 2013 that Jennifer and Sarah Hart had been depriving the kids of food as punishment. In a statement, Alexandra Argyropoulos said she "witnessed what I felt to be controlling emotional abuse and cruel punishment" toward the six children. March 23, Bruce and Dana DeKalb, next-door neighbors of the Harts in Woodland, Washington, called state Child Protective Services because Devonte had been coming over to their house almost every day for a week, asking for food. A child welfare worker visited the house twice but wasn't able to make contact with the family. On March 26, she called 911 and asked for a deputy to respond to the home -- just hours later, the family's SUV was found at the bottom of the California cliff.